These are my expensive vices. I say it is a vice because when the notion hit me, I have to have these right away regardless of how much it costs or who gets aggravated having to find these stuff for me. 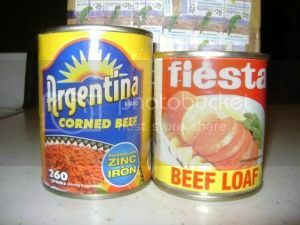 Especially the Fiesta beef loaf which is only marketed in the Visayas and southern Philippine regions. When I get my hands on these goodies I make them last as long as I could to compensate for the expense and trouble my family has to go to so I can have what I want. The husband said I am a spoiled brat and I guess I am, lol. I normally fry the beef loaf but only after slicing, then dipping the slices in beaten eggs. The result is so delicious. At least to me. The husband will not even attempt to eat it. As for the corned beef, it is easy to fix this one. I just dump the contents in a pot, wait for it to simmer then turn the heat off. It should be ready to eat with rice. There are elaborate ways to fix these canned goods but I prefer them simple because that is how I remember them fixed while I was growing up.